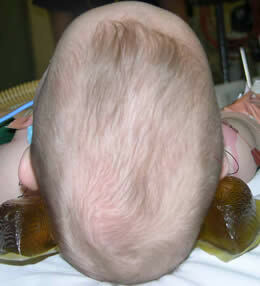 If detected early enough, I correct scaphocephaly using a spring assisted cranioplasty. After 9 months of age a modified pi-plasty is used. We have had several cases that have presented at age 5 and beyond with symptoms of raised intracranial pressure and headaches. These children have required more extensive calvarial vault remodeling and have all had excellent improvement in their symptoms. Treatment depends on the severity of the deformity. Cases with a mild metopic ridge can be left. 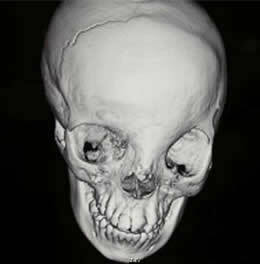 More severe cases have a triangular forehead, closely spaced eyes and retrusion of the lateral brow. Intraoperatively there are often signs of localized raised intracranial pressure in the lateral forehead region with very thin indented bone internally. These cases require frontoorbital remodeling. Springs have been shown to correct hypotelorism and we consider their use for cases of very marked hypotelorism. 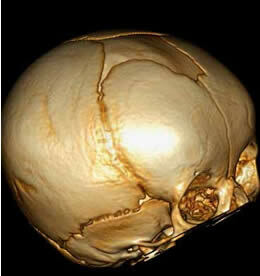 Premature fusion of one coronal suture distorts the adjacent eye socket, forehead and cranial base. Treatment in each case is individualized and it is very important to correct both the soft tissue and the bony asymmetry. Premature fusion of both coronal sutures results in a short (brachycephalic) head. 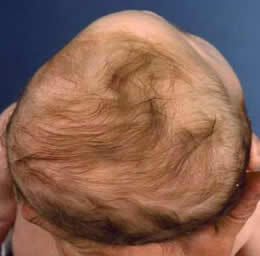 This may sometimes occur as part of a syndrome eg Apert syndrome. In less severe cases, such as that pictured here, we perform a minimally invasive procedure with spring expansion of both the fused coronal sutures and the normal lambdoid sutures. In more marked cases we use a variation of the DCB (Dynamic Cranioplasty for Brachycephaly) procedure designed in Sweden.